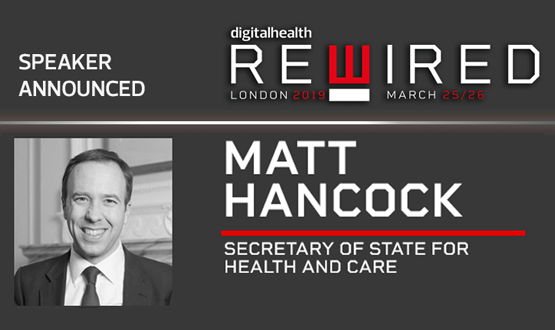 The Secretary for State for Health and Social Care and self-proclaimed tech enthusiast, Matt Hancock, has been announced as a keynote speaker for Digital Health Rewired. Hancock, who was previously Secretary of State for Digital, Culture, Media and Sport, will be speaking on day two of Rewired which is being held on 25-26 March 2019 at London Olympia. The minister is a passionate advocate of the huge potential digital technologies to modernise NHS and social care services. Before becoming an MP he worked in the IT industry. In his Rewired keynote address Hancock will set out how he will support leaders to build digitally-enabled services, based on open standards and interoperability, to transform the quality and responsiveness of health and care. The Department of Health’s recently published draft tech strategy marked a sea change in shifting focus to open platforms and standards and a cloud first approach. Our second morning keynote is Doug Gurr, the chair of the British Heart Foundation’s Board of Trustees, and country manager at Amazon UK. Speaking in his capacity as chair of the BHF, Doug will explain how the medical research charity is now focusing investment in at scale data research in order to achieve a transformational breakthrough in the prediction and prevention of heart disease. BHF currently funds over £100m of research projects each year. Hancock and Gurr will be joined by clinician, academic, author and journalist, Dr Ben Goldacre who is the chair of the government’s national HealthTech Advisory Board. Other speakers also include NHS England’s chief digital officer, Juliet Bauer and MP and former life sciences minister, George Freeman. Digital Health Rewired is the new two-day conference and one-day that aims to connect health IT leaders and professionals with the latest disruptive digital health innovations. Register your place at Rewired today.